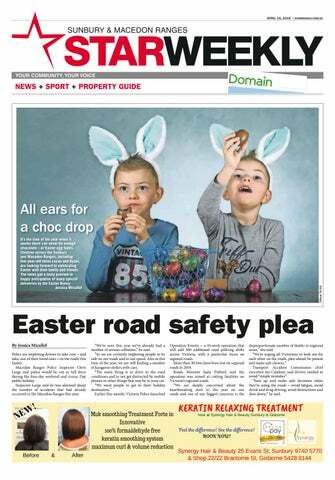 Police are imploring drivers to take care – and take care of their loved ones – on the roads this Easter. Macedon Ranges Police Inspector Chris Large said police would be out in full force during the four-day weekend and Anzac Day public holiday. Inspector Large said he was alarmed about the number of accidents that had already occurred in the Macedon Ranges this year. “We’ve seen this year we’ve already had a Operation Kinetic – a 10-week operation that disproportionate number of deaths in regional will add 300 additional road policing shifts areas,” she said. number of serious collisions,” he said. “We’re urging all Victorians to look out for “So we are certainly imploring people to be across Victoria, with a particular focus on Now Synergy Hair Beauty regional roads. Sunbury & Gisborneeach other on the roads, plan ahead, be patient safe on our roads andat to not speed. Also at this & More than 30 lives have been lost on regional and make safe choices.” time of the year, we are still finding a number Transport Now Accident Commission roads in 2019. of kangaroo strikes with cars. at Synergy Hairchief & Beaut Roads Minister Jaala Pulford said the executive Joe Calafiore said drivers needed to “The main thing is to drive to the road Now atbySynergy Hair & Beauty Gisborne was aimedSunbury at cutting &fatalities on avoid “simple mistakes”. conditions and to not get distracted mobile operation Now at regional Synergyroads. Hair & Beauty Sunbury & Gisborne “Ease up and make safe decisions when phones or other things that may be in your car. Victoria’s “We are deeply concerned about the they’re using the roads – avoid fatigue, avoid “We want people to get to their holiday heartbreaking start to the year on our drink and drug driving, avoid distractions and destination.” Earlier this month, Victoria Police launched roads and one of our biggest concerns is the slow down,” he said. reservoir since early this year. Their water will now be supplied with a blend of water from local sources and the Melbourne water supply. Western Water manager Graham Holt said the water supply changes were crucial to uphold the standard of Rosslynne Reservoir for the future. “To preserve Rosslynne’s water levels and ensure future water supply, we are switching most towns in the Macedon Ranges over to the Melbourne drinking water supply system,” he said. “Lancefield, Romsey and Woodend will continue to receive water from local supplies, but will be supplemented by water from the greater Melbourne water supply system. “It’s normal to notice a slight change in taste when your water supply is changed, as water … varies. “All the drinking water we supply is safe, healthy to drink and meets the Australian Drinking Water Guidelines.” For information about your water supply, visit westernwater.com.au. Boom gates are back A final twist has been added to the Melton Highway level crossing removal. Kyneton sculptor Jason Waterhouse has recreated the original boom gates in a sculpture installed under the new rail bridge. The art piece, entitled Levelled Crossing Crossing, reuses the boom gates removed from the former Melton Highway level crossing, and ties them together in a knot. Waterhouse said he wanted the boom gates to remain true to their function. “My practice deals with re-imagining real objects,” he said. “And I thought, isn’t it hilarious that all this work goes into removing these boom gates. “I was interested in the ironic idea of putting back the boom gates to the site after all the effort … which is what I’ve done. “I just thought of the function of the boom gate – the opening and letting people through.” Waterhouse’s concept was chosen by Melton Highway Level Crossing Removal Project members, Brimbank council, Creative Victoria and the Office of the Victorian Government Architect. Community groups and organisations across Sunbury and the Macedon Ranges are delighted with their grants success. Hume Men’s Shed Sunbury was among the big winners – it received a $1320 grant. Shed president Mike Newman said the money was very welcoming. “Getting these grants really helps,” he said. “We’ll be able to send five or six members out to first aid courses. “We’re a not-for-profit organisation – we basically rely on shed members’ annual dues, plus things like Bunnings sausage sizzle. “It’s the little things like that, they all add up.” Citizen’s Advocacy Sunbury and District, Macedon Ranges Further Education Centre and the Macedon Ranges Netball Association also received money under the Volunteer Grants program. Citizen’s Advocacy’s $5000 will go towards online and video training and mentoring programs. The Macedon Ranges Further Education Centre received $4750 to help with training and upskilling attendees. Federal McEwen MP Rob Mitchell said: “The training will allow tutors to support students with individual learning needs on a one-on-one basis, which is such a help to those who need that little bit of a personal support with their learning goals.” The netball association received $4000 to upgrade IT equipment and to replace a broken gazebo. The fire danger period remains in force in the Macedon Ranges. Anyone who burns off in the area without a permit risks being fined. Due to prolonged dry conditions and predicted low autumn rainfall, the CFA has decided to keep restrictions in place for the shire. The reminder comes after several Macedon Ranges CFA brigades recently reported call-outs to illegal burn-offs across the region. A protective services officer was charged on Thursday following an internal investigation last year. The PSO has been charged with recklessly cause serious injury and recklessly cause injury and unlawful assault. The PSO was off duty at the time of the incident in Sunbury on October 15, 2018. He is expected to face court at a later date. The member is currently suspended with pay. Catch public transport to the dawn service Free bus services will run to the Mt Macedon ANZAC Day Dawn Service from each major township across the Macedon Ranges. Bookings are essential and close Tuesday 23 April 2019. Visit organscoaches.com.au/tours to book your seat. Softball stars a big hit By Jessica Micallef Two Sunbury softballers have hit the biggest home runs of their young careers. Taliah Kelly and Matthew Bedwell have won the 2018 Victorian schools Sporting Blue Awards for their softball achievements. The Sunbury Softball Association players said they were both proud and excited to have won the prestigious awards. Previous winners of the awards include AFL player Patrick Dangerfield and AFLW player Louise Stephenson. The new and improved Malmsbury Cricket Club is showing off its shiny new upgrades. The $150,000 upgrade of the cricket ground and new facilities has delighted club secretary Gary Nicholls. “We’ve got a brand new white fence all the way around the perimeter of the oval,” he said. “It looks very much like those English county grounds with the white picket fences. “We have three brand new cricket practice nets and we’ve had an upgrade to the pavilion. It looks bloody marvellous.” Mr Nicholls said the club was hoping the upgrades would help it attract more players. The club provided $20,000 towards the upgrade, Macedon Ranges council contributed $30,000 and the state government $100,000. To see the new facilities, visit the club at Malmsbury Cricket and Recreation Reserve. HE’S HERE FOR US Rob Mitchell MP MEMBER FOR MCEWEN www.robmitchell.com.au Authorised by R Mitchell ALP Shop E00-48, Craigieburn Central Shopping Centre, 340 Craigieburn Road, Craigieburn. Anzac Day’s young face By Jessica Micallef Sunbury’s young people will participate in a new Anzac Day vigil this year. The Sunbury Anzac Youth Vigil will allow the town’s young people to pay their respects to Australians who have died in war. Sunbury RSL secretary Harry Beckwith and vigil committee member Jarrod Bell are spearheading the organistion of the event. Mr Beckwith said they wanted young people to become more engaged with Anzac Day in Sunbury. participate in the vigil, with more than 140 young people aged between six and 25 years taking part in the event. Mr Bell said the event was a great chance for the younger generation to understand the meaning of Anzac Day. Free Strength for Health class as part of This Girl Can Wednesday 17 April 2019, 11am–11.45am Kyneton Toyota Sports & Aquatic Centre Designed for women over 50, this strength training program assists with arthritis relief, sleep improvement and increased mental wellbeing. “The vigil gives an opportunity for our young people to do their bit, to say thanks and to reflect on the importance of Anzac Day,” he said. The vigil will start at 6pm on Wednesday, April 24, at the Sunbury cenotaph. We’re completing upgrades on the Bendigo line. Coaches are replacing some evening trains for all or part of the journey while works take place. MY PLACE Christian Bagin is no stranger to the stage. The Riddells Creek resident chats with Jessica Micallef about performing in the Melbourne International Comedy Festival and his love for his hometown. park and it’s a relationship and things go fun with alien invasions. Both shows are family shows. What show is your favourite to perform in? I can’t say. I love them both for different reasons. What would people be most surprised to know about you? I’m Hungarian. What do you like best about the Macedon Ranges? It’s still got the community vibe. You go to the shops and you run in to people you know. It’s great. A five minute drive from my house and I’m walking in the forest, I just love that. We’ve got this beautiful environment. If you could change one thing about the area, what would it be? What is your connection to Sunbury and Macedon Ranges? Bike paths. I’d love to see that happen, connecting all the towns with bike and walking paths. COMMUnITY CALEnDAR WANT YOUR EvENT LiSTED? Community Calendar is made available free of charge to not-for-profit organisations to keep the public informed of special events and activities. 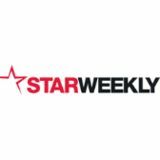 Send item details to Star Weekly Community Calendar, Corner Thomsons Road and Keilor Park Drive, Keilor Park, 3042, or email to communitycalendar@starweekly.com.au. Deadline for copy and announcements is noon Tuesday. VICTORIAN PUBLIC SCHOOLS SHOULDN’T HAVE TO MISS OUT The Victorian Government believes every student should be fully supported to succeed. That’s why we’ve invested $10.8 billion into education for our growing state. But Canberra’s proposed funding deal means Victorian public schools could miss out on $500 million of federal funding every year. We just want our fair share. This alluring property, with Five Mile Creek reserve right on the doorstep, offers a lifestyle in a lovely house on a block of about 0.73 hectares, where a chicken coop and vegie patch mingle with a rose arbour, sweeping lawns and mature trees. Internal spaces have architectural elements that mirror the gabled roofline and dormer angles. Recessed skylights pour light in from the pitched ceilings, while differing floor levels and ceiling heights create rooms flowing from openness to more intimate. The main bedroom is up top, with dormer windows on show; it has built-in robes and a stylish en suite, as well as french doors to a rear balcony. The two downstairs bedrooms share a swish bathroom with glossy floorboards, pedestal basin, white subway tiling and a clawfoot tub perched under a narrow arched window. A grey-carpeted lounge room has steps down to the floorboarded meals and family areas, with the kitchen tucked to the side. This has plenty of storage and bench space, all mod-cons and good looks. The meals area has double sliders to an elevated covered deck, while a second ground-level deck is accessed via bifolds from a large workshop behind a double garage. The deck’s open pergola is above very pretty gardens (watered from a tank). Woodend Primary School and shopping precinct are within walking distance. 1502m² 6 Boyd Court ROMSEY This neat brick veneer property, tucked away in a lovely quiet court, offfffers everything a young couple or family starting out would want. Set in a beautiful part of Romsey this delightful home has been fully repainted, carpeted and has had some new blinds ﬁtted. Step from the generous open plan kitchen living and family area into the backy k ard where the property offfffers ky plenty of opportunity for the buyer to install the dream pool or to build a large shed for a boat, caravan or for the trades person. “80 Kilometres per Hour” Those of us who travel from Lanceﬁeld to Romsey must be so excited! We W can now travel at - wait for it 80kms per hour! Those travelling further aﬁeld will be so delighted when the speed between Romsey and Sunbury becomes consistent and all the roadworks are completed. The road between Lanceﬁeld and the Sunbury Bulla Road has long been a source of concern and there have been numerous accidents and fatalities over the years. I have travelled the road since around 1984 as well as my children from when they started to drive (now twenty plus years ago). To T say that stretch of road was dangerous would be wrong, it did however, r r, take careful driving and concentration and on wet days the road became quite treacherous in places. I think the road building process has tested the patience of us all. But now, thank goodness, we can enjoy a well built road with over taking lanes!! How exciting! Calco Electrical Pty Ltd â&#x2DC;&#x17D; 9744 1555 41 Oâ&#x20AC;&#x2122;Shanassy Street, Sunbury Email: info@calcoelectrical.com.au Rec 122 www.calcoelectrical.com.au â&#x20AC;&#x153;Servicing the local community for over 37 yearsâ&#x20AC;? Motoring section of Network ClassiďŹ eds. All Electrical Wiring, Airconditioning, Heating, Phone, Data, TV, Sound Systems, Hotplates, Oven Installations Repairs Service Safety testing, tagging and much much more! Speak to our classiďŹ ed team and ďŹ nd out how easy it is to advertise. Start building your brand today and be seen every week in the Network ClassiďŹ eds Trades and Services. The General Purposes and Amenity (Amendment) Local Law 2019 (amending Local Law) makes a number of necessary technical amendments to the current Local Law to achieve the application of the Roadside and Footpath Trading Policy and any future policies that may be applied by Council to uses and activities on Council land or roads. Have your say • visit mrsc.vic.gov.au/yoursay • view the draft amendment in person at any of Council’s service centres • send a written submission to mrsc@mrsc.vic.gov.au or PO Box 151, Kyneton VIC 3444. A meeting to hear and consider any submissions on the proposed amendment will be held on Wednesday 12 June 2019 at the Gisborne Administration Centre, 40 Robertson Street, Gisborne. Submissions close Monday 13 May 2019, 12 noon. Feedback invited on proposed amendment to Local Law No. 10 Residents are encouraged to have their say on a proposed amendment to the Local Law No. 10. General section of Network Classiﬁeds. home, especially late in games. “They really know how to utilise that ground and run to the right spaces. “There’s no excuses. Darley would probably say we had control early on and nothing to show for it.” Hodgson said while disappointed with the loss, there was still a lot of positives to come from his first game in charge. He said the fact they had 27 scoring shots showed they were doing something right against a good side. Daylan Kempster was the only multiple goalkicker for the Lions, kicking two goals. Hodgson said the midfield group of Alik Magin, Mitch Conn, Lachie Bramble and Greg Hay controlled the game. Ruckman Jayden Eales had a dominant game as well. Hodgson said Leigh Brennan, in his first game for the club, provided a good target up forward, but was one of the main culprits in front of goal with poor kicking. against Castlemaine. The Bulldogs controlled the game from start to finish, winning 17.20 (122)-3.11 (29). Jack Scanlon kicked four goals for the Bulldogs, with Trent Crosbie and Joshua Grabham named their best. The Sunbury Kangaroos opened their account for this season, beating crosstown rivals the Sunbury Lions in the Essendon District Football League Women’s Premier division. It was a story of two halves, with the Kangaroos dominating the first half before a more dour second half. The Kangaroos did all the damage early on, winning 14.7 (91) to 0.2 (2). Kangaroos coach Bevan Green said it was good to get their first win on the board. “Wins are always good and you have to celebrate them,” he said. “It’s nice to get the first win. “It was a tale of two halves. We came out really strong in the first half, I think we put on 70-odd points in the first half, but a big ground and hot day, I think took its toll a bit.” Green said improved fitness would come as the side played more games. “We focused more on skills in the off season,” he said. “Our fitness isn’t where it could be, but that will come. Rupertswood has caused the first upset of the Riddell District Netball League season, beating Romsey. The Sharks led from start to finish, winning 53-41. Tee Salanoa, in her first game for the Sharks, shot 25 goals. For the Redbacks, who were missing Chelsea Ross, Rebecca Hicks shot 32 goals from 37 shots. Riddell and Diggers Rest played the match of the round, finishing with a 38-all draw. Macedon, Melton Centrals and Wallan were the other winners against Broadford, Lancefield and Rockbank. Rupertswood snuck home in a thriller against Romsey in the Riddell District Football League. The Sharks came from 22 points down midway through the last quarter to win, 16.10 (106) - 15.12 (102). Nick Grigg kicked six goals for the winners. Diggers Rest won the grand final rematch, beating Riddell 15.4 (94) - 7.9 (51). Macedon, Wallan and Melton Centrals all had big wins against Broadford, Lancefield and Rockbank respectively. The Sunbury Jets women returned to the winners’ list in the Big V state championship division. The Jets convincingly outplayed the Southern Peninsula Sharks, winning all four quarters in the 86-39 win. All nine Jets players got at least 11 minutes court time, with all but one player scoring. Lynn Leaupepe continued her good form, scoring a season-high 32 points. In men’s division 1, the Jets lost to Warrandyte Venom, 74-64.